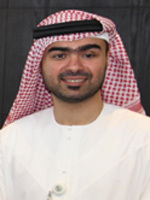 With almost 10 years of work experience, Mohammad graduated with distinction from HCT – Dubai Men’s College with a Bachelor’s degree in Business & Management, and is certified as an EFQM Excellence Assessor, Lead QMS Auditor, Dubai Quality Award Assessor and has professional memberships to international management and quality/safety organizations: ILM, ASQ, IOSH and DQG. He has served as a member on national committees of nonprofit Government owned organizations in strategic planning and organizational excellence teams. He has also achieved several professional and academic awards such as "Young Leader of the Year" Award 2015 by Alleem Excellence Awards at the 7th Annual Leadership & Management Week conference; “Excellence in Quality Management” award 2014 certificate by World Confederation of Businesses; “Certificate of Excellence” award by Drydocks World’s Chairman; “Plaque of Appreciation for Outstanding Performance” by Dubai Maritime City’s CEO; UAE President medal for Academic Excellence by Ministry of Presidential Affairs / HCT…etc. Mohammad’s experience is in business excellence models, HSEQ Management, quality management system, process improvements & re-engineering, strategic planning & corporate performance management and CSR. He has both national and international management experience. His career highlights include the roles of Asst. Manager – Strategy in Dubai Maritime City where he worked on Strategic Planning and Corporate Performance Management and Business Process Engineering; Asst. Manager – Strategy (CEO Office) at Drydocks World – Dubai where he developed the strategic corporate performance system which was a successful pioneering project for the organization; and he then took the role of Global Quality Manager and headed the Quality teams consisting of 6 departments with more than 150 staff members across the group in Dubai and South East Asia and successfully managed to restructure / realign the quality departments, quality policies, quality management systems and key processes across the group to enhance efficiency & effectiveness. He also established the Business Excellence Department in line with the organization’s strategic direction and led the department as General Manager. He currently Heads the HSEQ Division as General Manager – HSEQ & Business Excellence and leads a team of more than 400 staff members. He is a member of the Senior Management Team which is the highest top management committee in his organization. Additionally, he also Chairs both the Think Tank (Innovative Suggestion Scheme) Committee and CSR Committee in his organization.